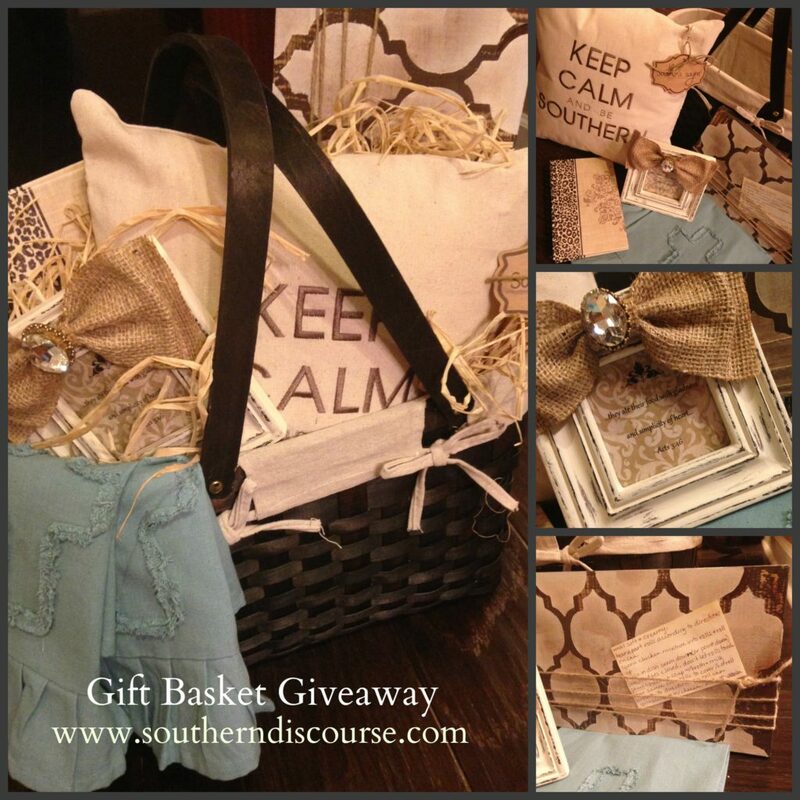 We are celebrating the launch of A Southern Discourse today by giving away this gorgeous Southern Discourse gift basket! 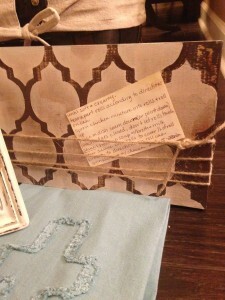 The 100th reader who subscribes to the blog and comments on an article will be our WINNER! I am telling you that you are going to WANT to win this! To be honest, I really had to resist keeping it for myself. But because I love you guys so much, I managed to get myself together and share. I know that if you take a look at what’s inside, you will love it as much as I do! 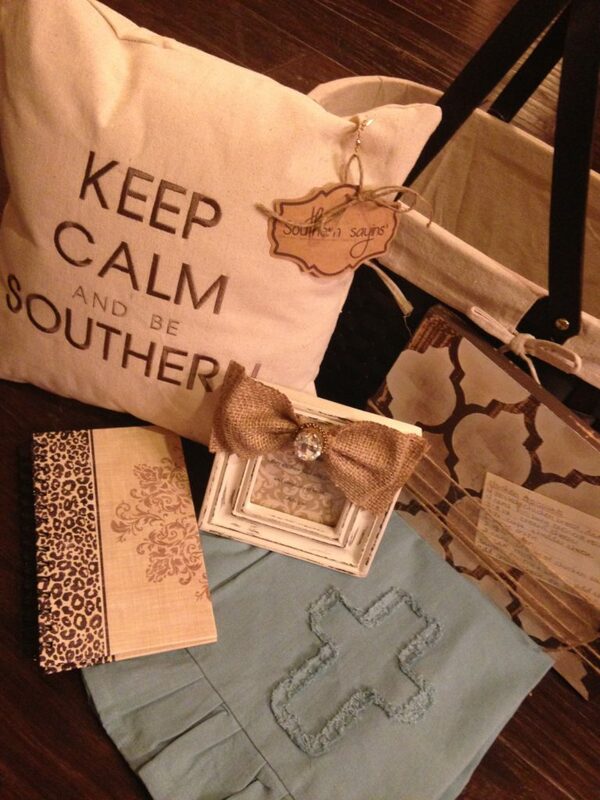 Many of these adorable things came from the cutest little boutique/spa in my town called Southern Chic Spatique. I love going in there and just browsing around. As a matter of fact, I think Southern Chic would make an awesome feature here on “The Porch,” don’t you? I’m going to see what I can do about that. But first! 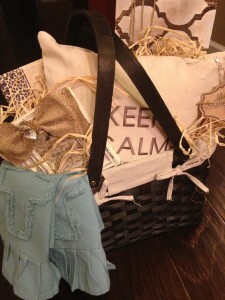 The gift basket preview! I love this Keep Calm and Be Southern Pillow by Southern Sayins’. The cotton canvas cover can be taken off and hand washed if it happens to get dirty. With all of the “keep calm” sayings going around now, this one just really got me, especially since I found it next to a pillow all about a good southern “hissy fit.” And what about those dusty teal tea towels with the ruffle and fringey crosses? Just couldn’t pass those up. They would look too cute hanging on the handle of your oven or on a cup towel hook. 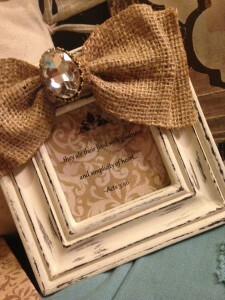 Next is this little 3.5 x 5 distressed frame with burlap bow and some sparkle. You could put a photo in it, but I put together and printed up for you the portion of Acts 3:46 that was featured on our Facebook page earlier in the week– “And they ate their food with gladness and simplicity of heart.” That “simplicity of heart” really is the key! 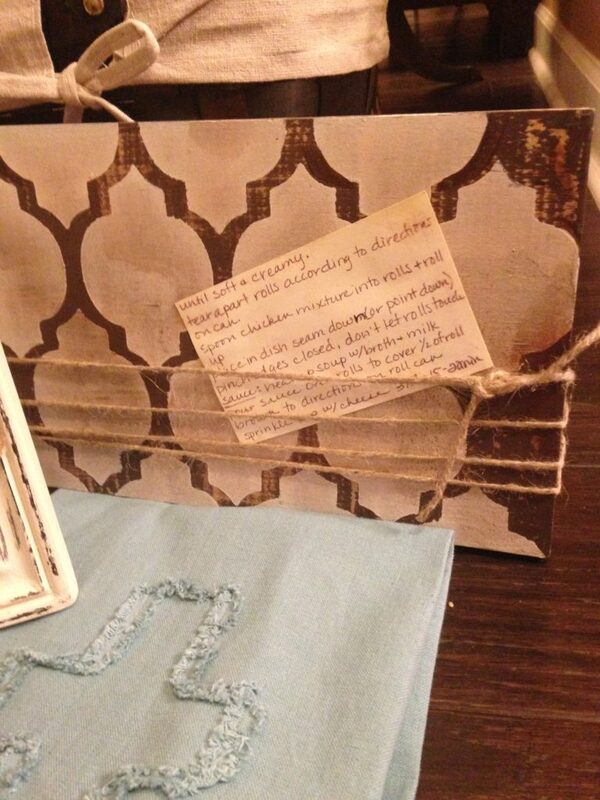 in the back makes it stand on its own, and tightly wrapped twine holds your recipe for you while you are cooking. Now your recipes are up off the counter, staying clean and neat, and easily seen while you make delicious dishes! You could also slip a photo in there when you weren’t cooking! Ok, I promised 2 exclusive Southern Discourse recipes, but I am not showing them here. They are a surprise! However, I promise they are ones you are going to love and end up using time and time again. So, let’s get to reading and subscribing and commenting. Somebody’s going to win, and I want it to be you! Im so excited about this blog. It touches so many places of my heart. S, I am so proud of you. Thank you, Toni! You are the best. So happy that you are starting this blog! It is so your thing!! Praying you have a lot of success!! Thank you, Melody! I am thankful for your prayers!! What a treasure Southern Chic Spatique is to Henderson and surrounding areas. I would love to be the recipient of this basket of goodies! Aren’t they though! I have just loved being able to go over there. Their spa services and their boutique products are just what our area needs! Thanks, Heather! Much love goes out to you! I have really enjoyed your articles! You are doing a fabulous job! I appreciate your taking time to share with us spiritual wisdom as well as great ways to show hospitality! Fantastic job! Keep up the great work!!! Thank you, Brandi! This adventure has already been such a blessing. I can’t wait to see how it all works out! I know I am going to have fun along the way. I am ready to do some more “hospitality” posts! There are two projects laying on the table in front of me right now that I just can’t wait to get started on. Woo Hoo!!! So excited that THE BIG DAY is finally here! Congratulations on a blog well-done! Thank you, Julie!! You have been there every step of the way, but don’t think that you are off the hook just yet! I have been waiting to read this blog and I have gotten so much from this first visit. You are a gifted writer with wisdom, and I look forward to reading more. Thank you so much! I am humbled and grateful that you enjoyed it. This has been such an exciting adventure, and I can’t wait to see where it goes! Look for new posts at least once a week! This is so exciting! So happy for you! Can’t wait to read all your ideas. Thank you! I am so glad you are here! I’m excited for this blog, too! A mutual friend had been posting about it on Facebook, and I have never subscribed to or followed a blog before. But this one looked like it would be a good one to start with, and so far, I love the topics/articles. Can’t wait to read what’s to come!! I am so glad you decided to join Southern Discourse. We will be new to blogs together! I really am just grateful to everyone who has read and enjoyed the articles. Our mutual friend has had a lot to do with getting this started. She is an amazing woman and a great encourager. You will probably see her on as a guest writer soon! Guest writers is a great idea! And she would definitely be a good one 🙂 I hope all goes well for you in this new adventure! Stacy, wishing you well on your new adventure! Thank you, Anna! I am excited about it. I am glad that you are on this adventure with me! 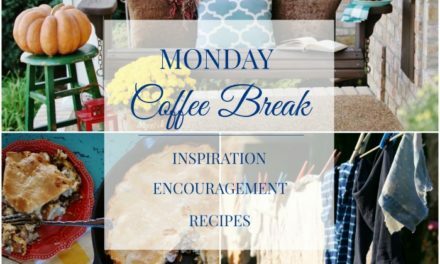 I’m so excited about the blog, and I’m so impressed with what you’ve already done! Beautiful! Thank you so much! Your support has truly been an encouragement! I have sincerely appreciated every bit of it. Amy Washburn Photography took all of the great photos on the home and about pages. Her work really made the site look exactly like I imagined. I am just grateful to her! Who knows what I would have looked like without her! Looking forward to following southern Discourse! Thank you, Shelia! I am so glad you are following! Thank you for joining the discourse! I am so excited to see it grow. 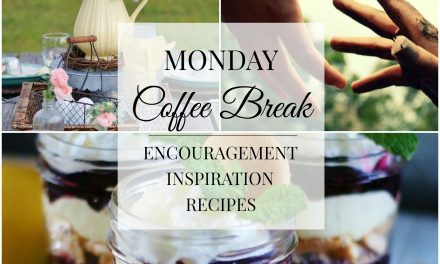 Look for a new post or two every week! It sure is! We are getting close though, so I am thinking that tomorrow will be our last day! Encourage your friends to get their names in while they can! This is going to be great, so happy for you! Thank you so much for joining the discourse! I am glad we are doing this together! Love the basket! Always looking for new blogs! Thanks, Ashley! I love this basket too! I can’t wait to give it away! I am so glad you joined A Southern Discourse! Look for new posts every week. I already have our next giveaway planned too. I am so excited!! This is so much fun that I am thinking we will do them regularly! So, I just was wondering. Is the giveaway basket to the 100th subscriber or to the 100th comment posted? It is to the 100th subscriber, but they must comment on one article too! So excited to see great success on your blog! Love this!! We have a winner for the basket! There will be another giveaway here on the Southern Discourse “Porch” in September!